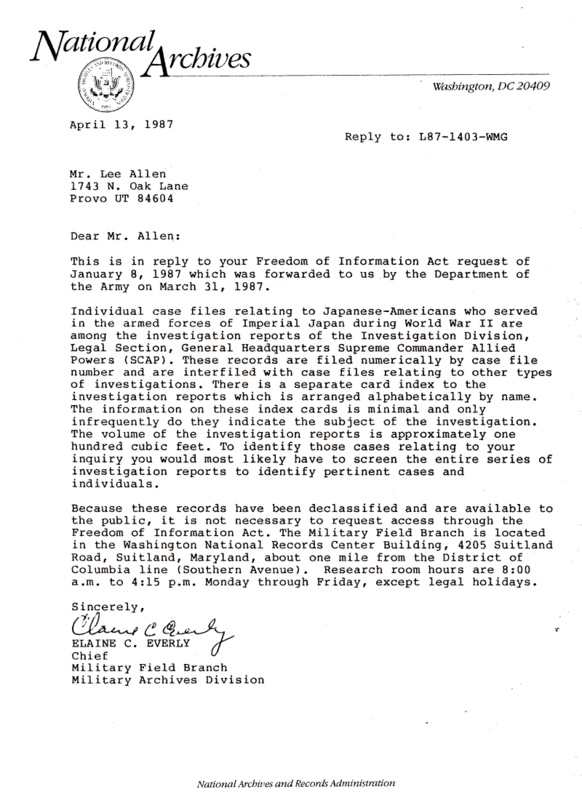 Document Notes: The service of Japanese Americans in the armed forces of Imperial Japan during WW II is a subject that begs further research. The United States did not make an issue of this service except in cases where the individual used his position to abuse captured Americans. (Meatball Kawakita being a prime example. See Doc 00020) During the war Japanese Americans bearing arms were treated as enemy combatants and more often than not eliminated along with other enemy. While estimates of the numbers involved ranges from somewhere around 7,000 upwards, histories and accounts of Pacific combat are replete with instances of contact with Japanese Americans. Generals Eichelberger and Wainwright in their books both mention Japanese Americans in the Imperial forces. After the war when the need for translators to aid in the occupation was great many who had served were hired to help. While it is charitable to forgive and forget this treason, the fact that it occured is indicative of the motivations of a large segment of those evacuated from the West Coast. Had they been allowed to run free during the desperate days of 1944 and 1945 when the U.S. was taking terrible casualties in the Philippines, Iwo Jima and Okinawa bedlam would have reigned. There are at least a couple disertations in this subject.